Lean stewing beef and mushrooms cooked in slow cooker until tender. This lightened up easy slow cooker beef and mushrooms is a great dinner for the meat lovers in your home. It’s easy enough for a weeknight and tasty enough for company. I’m not a huge steak fan, but I love hearty beef vegetable soups, stews and braised dishes, like this slow cooker beef and mushrooms. And a simple meat and potatoes meal always pleases my mid-western raised husband. So everyone is happy, an important consideration when trying to eat better and lose weight without having to cook separate meals. How Many Freestyle SmartPoints in this Lightened Up Recipe for Easy Slow Cooker Beef and Mushrooms? It is possible to eat hearty satisfying foods and lose weight. Each Serving has of this easy and delicious lightened up easy slow cooker beef and mushrooms dish has just *5 Weight Watchers Freestyle SmartPoints. This recipe is loosely adapted from one of my most recent cookbook purchases, Fix-It and Forget-It Lightly: 600 Healthy Low-Fat Recipes for Your Slow Cooker, by Phyllis Pellman Good. I made several changes, including substituting fresh mushrooms for jarred, but kept the fat-free cream of mushroom soup and dry onion soup mix. The recipe instructs you to just combine everything together in the slow cooker and let it cook on low for 5 to 6 hours, which would be fine when you are really pressed for time. But, I took a few extra minutes to season the beef with salt and pepper and then brown it in a skillet and also cooked the mushrooms, in two batches, before tossing everything into the cooker. Serve over noodles, rice, pasta, mashed potatoes or cauliflower rice or zoodles for the carb-conscious. This lightened up slow cooker beef and mushrooms is simple home cooking that’s satisfying and just plain good – just *5 Weight Watchers PointsPlus, or *5 WW Freestyle SmartPoints per serving. 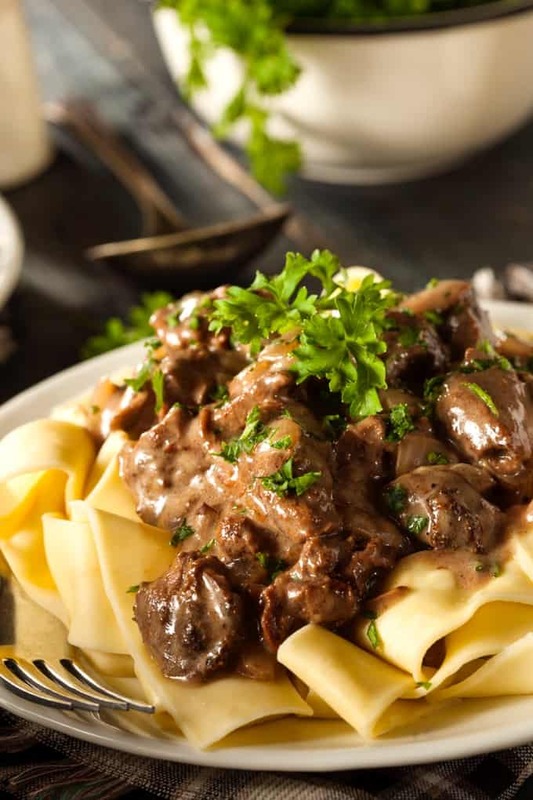 If you’ve made this Crock Pot Beef & Mushrooms, please give the recipe a star rating below and leave a comment letting me know how you liked it. 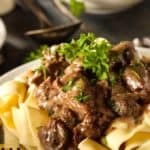 Lightened up slow cooker beef & mushrooms is an easy, healthy & delicious low calorie family friendly meal from Fix-It & Forget-It Lightly cookbook with just *5 Weight Watchers Freestyle SmartPoints that my husband loves as much as I do. Ideal slow cooker size: a 4-Quart. Place the beef in slow cooker. Brown the mushrooms, in the same skillet, again cooking them in 2 batches so they aren't crowded in the pan, and add them to the slow cooker. Add the red wine to the skillet and stir up any browned bits. Stir in the mushroom soup and onion soup mix until the mixture is blended, and then add to the slow cooker. Give everything a stir to combine. Cover and cook on LOW for 6 to 8 hours, or until fork-tender. If time is short, skip the browning and just combine everything in the slow cooker, cover and cook on low for the recommended time. This was delicious! I cut the stewing beef a bit because it comes in huge chunks, and everything was so good. I served it over brown rice. The sauce served on the rice was so good as well. How easy was that! Thank you for this. I will be making it regularly. This sounds wonderful… can white wine be used in place of the red wine? Thank you. How much is 1/6 of a serving size. 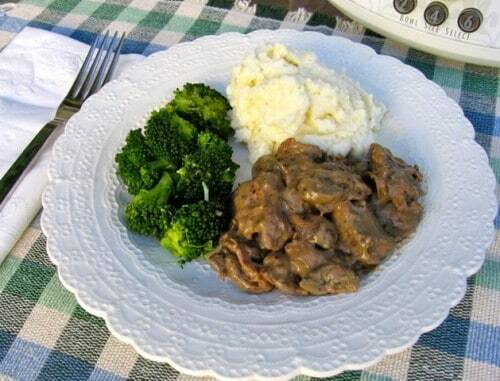 I made the Slow Cooker Beef & Mushrooms today…….loved it! I served it with Egg Noodles but it would be awesome with mashed potatoes as well. I am looking for more WW Friendly Recipes for additional variety — I will definitely make this again. I thought it had the perfect amount of gravy…….but one person in my family wished there was more gravy (since it was so good)……so the next time I make it, I may attempt increasing or doubling the gravy portion of the recipe to see what happens (although that will make it slightly higher in WW Points). Thanks for the recipe!